The Big Draw, my postcard for the postcard swap. 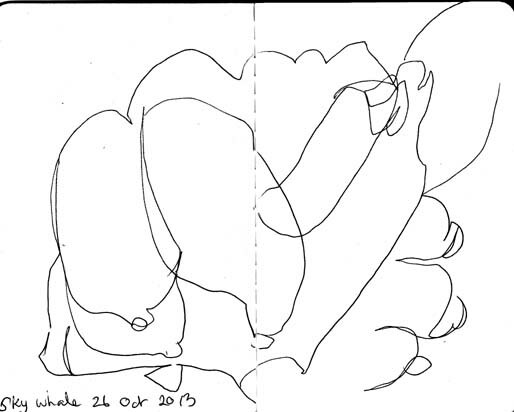 The Big Draw was held at the National Gallery of Australia last Sunday. In the very short period of 3 hours participants had the opportunity to explore 10 different areas to work in. I made it to 6. I started off fairly conventionally with my preferred ‘blind drawing’ of models from the Canberra Institute of Technology, wearing garments designed by current students. Two sketches ‘Voguing’ with the CIT students. I then headed around to ‘Altered Books’, outside the William Kentridge exhibition where participants were encouraged to use pages from books as the basis for drawing and collage. 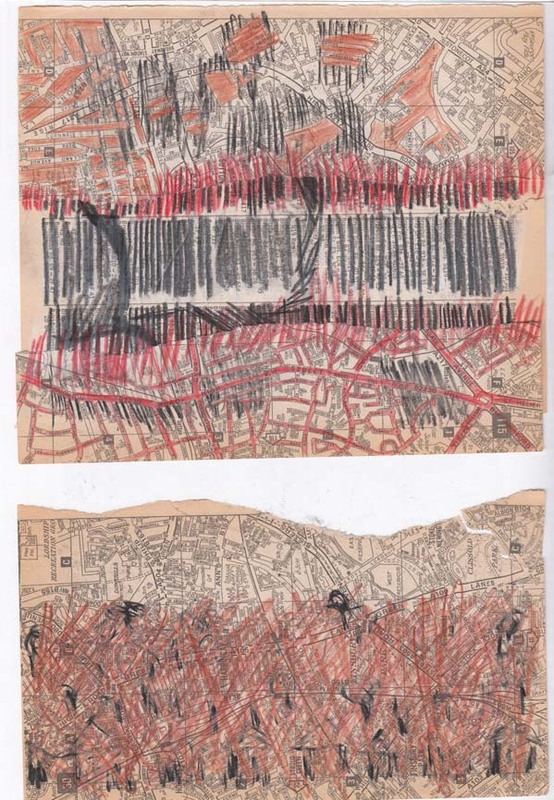 Two drawings, one with collage elements, at ‘Altered Books’. What I really liked here were the lovely charcoal pencils we were given to draw with. 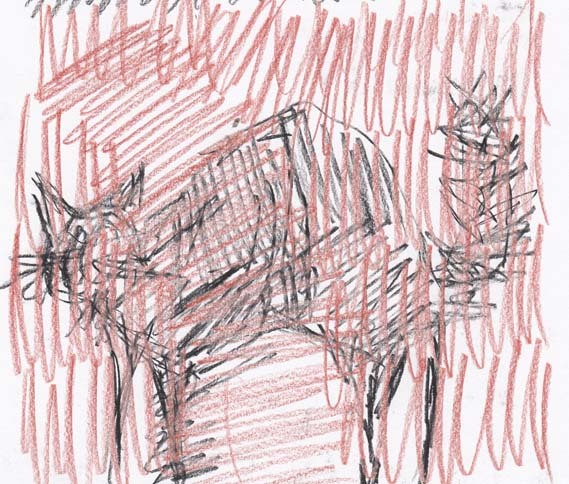 I also discovered that the waxy Lyra pencils we had also provided a great resist to the charcoal. My next drawing took advantage of these properties. Cat drawn in charcoal over a Lyra pencil background. 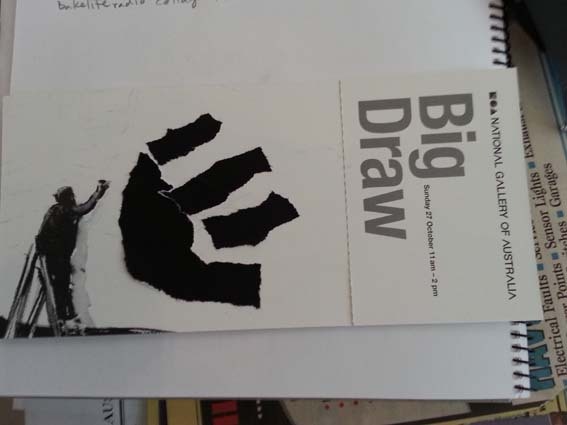 I then went into the most exciting station ‘Drawn to Move’, inside the Kentridge show, where I-pads had been set up with a stop animation app that allowed you to capture your image as you drew. You could then send the animation to yourself. Alas my animation never made it home (I’m not sure why), but I’ve since found a similar app for my android phablet that I’ll demonstrate in a future post. By the time I made it to ‘What do you see?’ a large group participation work on the floor in front of Jackson Pollock’s Blue Poles, I was starting to flag. 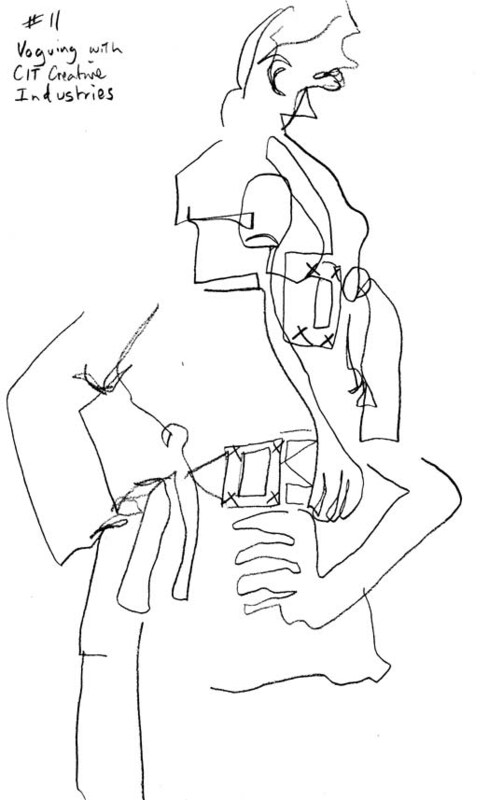 I moved fairly quickly onto ‘Exquisite Corpses’, that favourite Surrealist parlour game where I ran into my life drawing teacher from university. It was good to see you again Tess! Time was running out so I made a dash past ‘Balcony Blueprints’ and headed into ‘Stick with it’ and ‘Paperscapes’ in the Aboriginal and Torres Strait Islander galleries. These stations were lots of fun and very inventive and thankfully didn’t require any major effort to participate in. 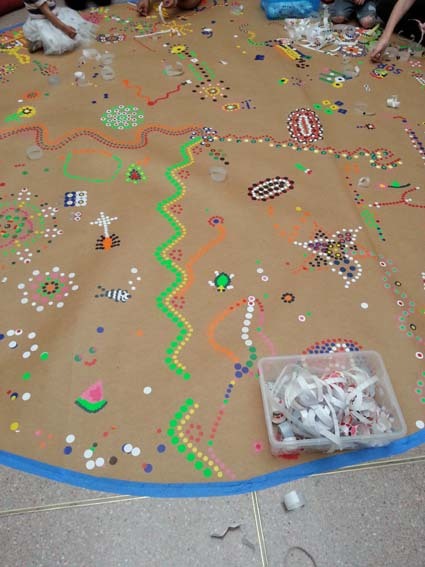 Playing a very clever riff on ‘dot’ painting ‘Stick with it’ used an office-workers trove of coloured adhesive dots to make patterns on a large circle of cardboard taped to the floor. There was plenty of space for everyone to join in. Part of the ‘Stick to it’ work. I moved on to ‘Paperscapes’ for my last piece of work. I was all ‘drawn out’ by this stage so I stuck to using large pieces of coloured paper to make a collage inspired by the striping of the Bungle Bungle ranges, very apt in this room of inspired landscapes. ‘Paperscapes’ in the Aboriginal and Torres Strait Islander galleries. After three hours it was all I could do to stagger to the information desk and hand in my postcard, to be swapped sometime in the future, with one from another participant. “When my daughter was about seven years old she asked me one day what I did at work. I told her I worked all day at college – that my job was to teach people how to draw. I have been trying hard not to lose the sense of momentum that I gained from the Michael Brennand-Wood workshop I did earlier this month. Without the excitement of the class atmosphere I find it all too easy to fall back into familiar practices and patterns. I was pretty excited to realise that one very direct response that I could take from the class was to use one of the pieces I produced for it’s original purpose, as a screen to print from. 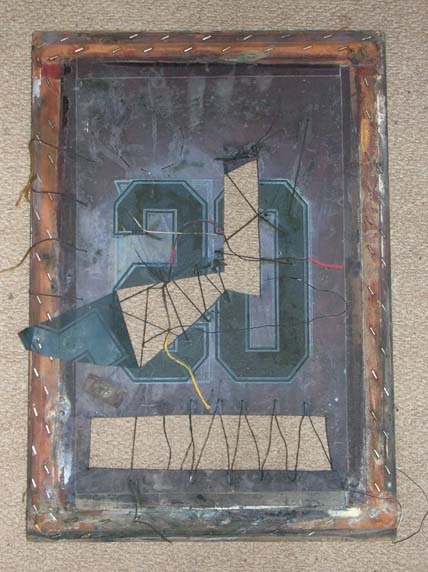 The screen with cut and stitched sections. In the workshop the screen had been the frame for exploration of 3D layers with connecting threads between them. 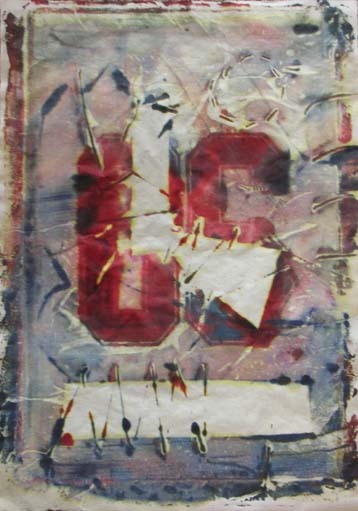 When it came to printing I first put the thickened dyes I use onto the ‘back’ of the screen and then placed paper directly onto it, carefully pressing down to transfer the image. The result is a subtle background with a much stronger transfer of colour where the original image remains on the screen. 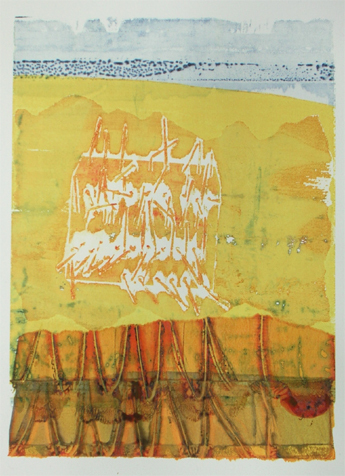 Stitched and cut screen image using thickened dye on Japanese paper, 9 October 2013. In order to use the ‘front’ of the screen, the normal approach, I had to cut those strings that prevented me from running the squeegee across the screen. 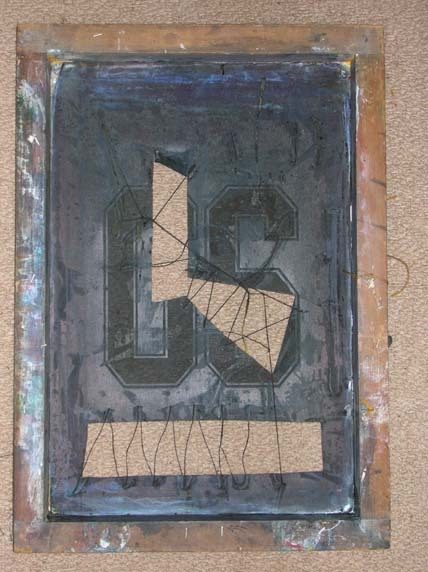 The ‘front’ of the screen prior to printing. Because the screen already had an exposed image on it, the thickened dyes only transferred to the paper where the original image was and where the screen had been cut away. This resulted in a very different image from the one above. I like the large amount of white space in this piece. Image resulting from the ‘front’ of the screen. 9 October 2013. I have continued to use the same screen for printing, modifying it as I go. Most recently I combined the use of certain sections of the screen with other techniques to produce this multi-layered approach. 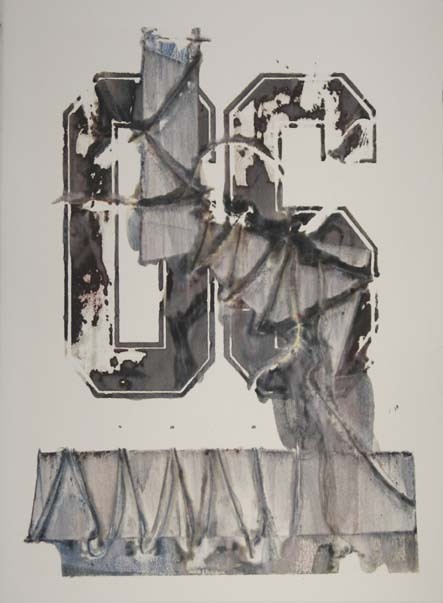 A combination of printing approaches, using the manipulated screen and de-contructed screen printing, with masking and overlapping. 25 October 2013. I think this is a very fruitful approach and I intend to continue exploring this idea at my next sessions at Megalo. 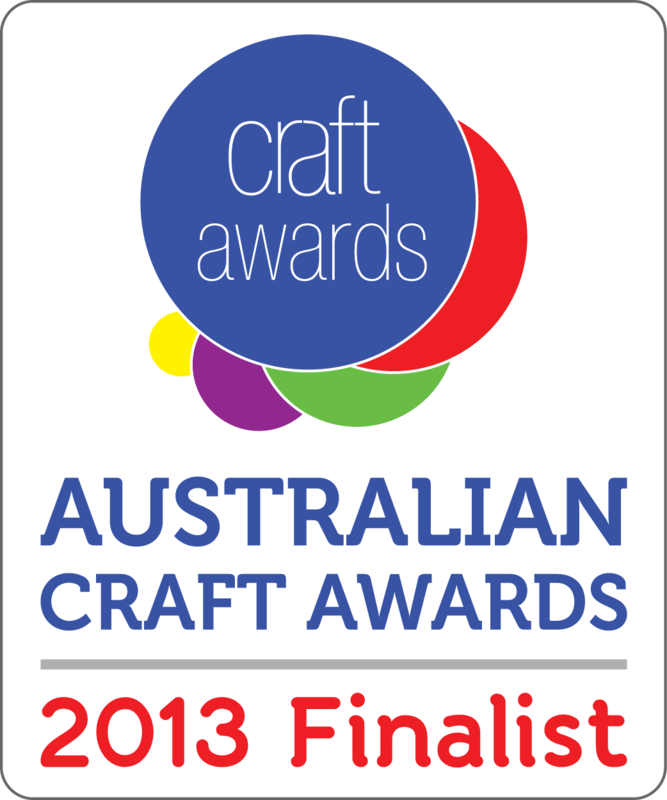 I’m very excited to find out that I have been selected as a finalist in the 2013 Australian Craft Awards. Dianne Firth (Display), Megan Jackson (Fashion – Accessories), Rosemary Goonan – The Rag Venture (Fashion – Apparel), Alison Jackson (Homewares and Jewellery), Eva Schroeder (Jewellery), Nellie Peoples (Jewellery), Gilbert Reidelbauch (Lighting) and Christine Atkins (Lighting). Today I finally caught up with Canberra’s most controversial art work – The Skywhale. She was designed by Patricia Piccinini, one of Australia’s most recognised contemporary artists, but like the purchase of Blue Poles back in the 1970’s many were horrified that the ACT Government actually spent money (in this case $A172,000) on an artwork. The Skywhale, in the arts precinct of Kingston, behind Megalo Print Studio and the Canberra Glassworks, 26 October 2013. Having finally met her face to face, I’ve decided that I quite like her! Below you can get some idea of the overall shape of the balloon, the pendulous breasts and the clawed tail. The Skywhale,sitting in front of the Fitters Workshop, 26 October 2013. I include this photo to help make some sense of my drawings of the Skywhale. 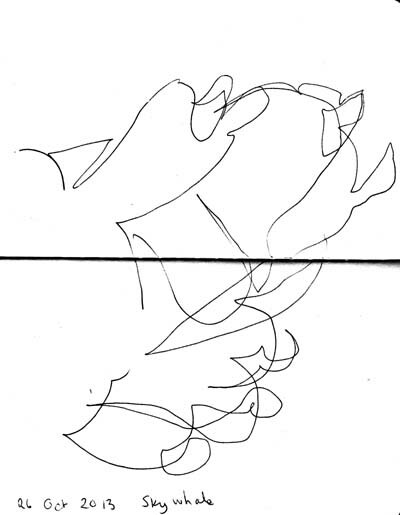 A 3/4 profile (from behind) drawing of the Skywhale, 26 October 2013. Above you have roughly most of one side and the tail. I found the drawing difficult because even though she was tethered there was quite a bit of movement with the balloon. The tail section of the Skywhale, 26 October 2013. 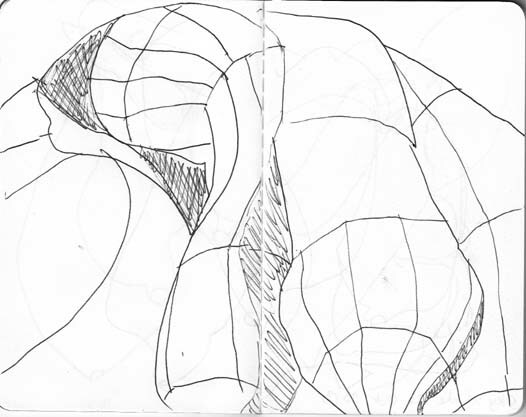 I think drawing the seams of the balloon , in the following sketch, delivers a sense of the roundness of the inflated balloon. Detailed view of the seams on the side of the Skywhale. We seem to have seen very little of the Skywhale since she first made her appearance in Canberra and I look forward to seeing her again in the future. 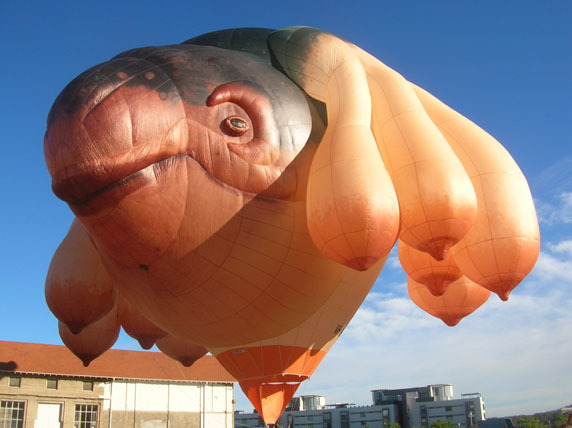 Alas, it appears that the Skywhale will be a transient art experience, as the Wikipedia entry on the Skywhale notes that she will have a lifespan of only some 100 flights. India Flint is one of Australia’s leading textile practitioners. Not only is her work fascinating, but she actively demonstrates her love of the environment through her environmentally sound practices. 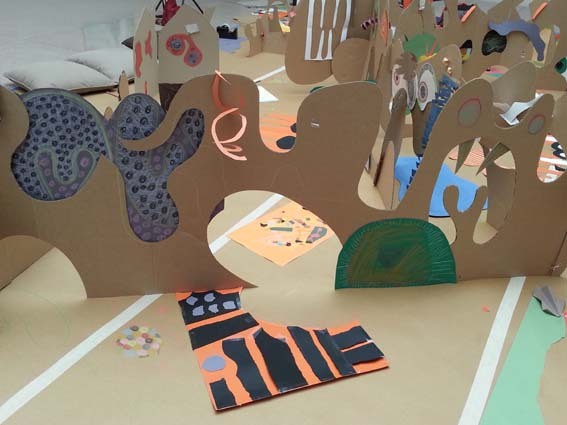 In August this year, India undertook a residency at Big Cat Textiles in Newburgh, Fife. Tracey McConnell-Wood has made a beautiful video, Being (t)here that gives you a glimpse of India’s residency. If you will be in Scotland from 30 June to 3 July 2014, you could participate in the Being (t)here class. I’ve got behind with posting my cafe drawings so here are the latest. I realise that I’m attracted to the repetition/ variation in many of my subjects. Cafe Wednesday 16 October 2013, umbrellas and coffee drinkers. 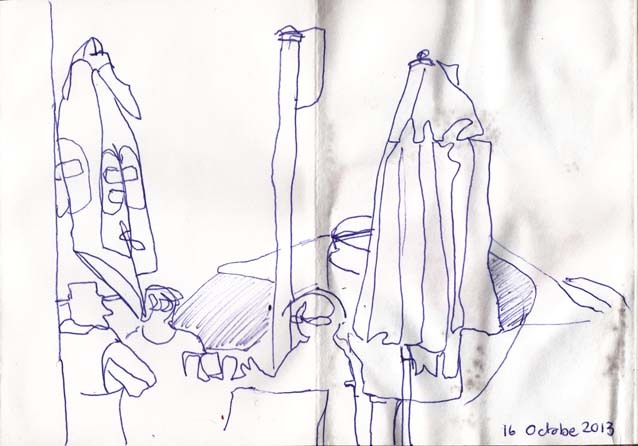 Now that spring has arrived the cafe umbrellas, which I love drawing, are back outside. 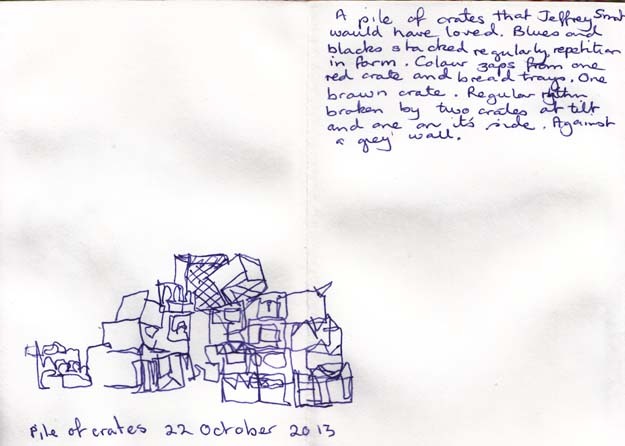 22 October 2013, stacked crates. This morning having coffee in another part of town I spotted a set of stacked crates which immediately bought to mind the work of the late Australian (expatriate) artist Jeffrey Smart. Woo, hoo! just got a phone call to tell me that my work Spirit of Giving has been selected as a finalist for the 2013 Goulburn Region Art Award. If the competition is anything like last year it will be a real challenge. There are no categories so the textiles, glass works, ceramics, sculpture and painting all go head to head. The announcement will be made on 1 November at 6.pm at the Goulburn Regional Art Gallery, everyone is welcome!